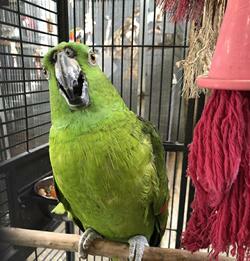 Spring Branch Animal & Bird Sanctuary (SBABS) is a 501(c)(3) Organization. A public charity under the Internal Revenue Service Code 170(b)(1)(A)(vi). Contributions are tax deductible. Almost all of us have been experiencing the same hardships with the current economic conditions. Some have been less fortunate that others. Previously, Adventures in Birds, was the recipient of many birds and animals that have lost their homes. To position ourselves to care for this influx of pets, I have organized SBABS to support the needs of these pets. Thanks to the efforts of volunteers (thanks, Julie)(Thanks Nic & Dar) SBABS has its own website. Availability and pricing subject to change without notice. 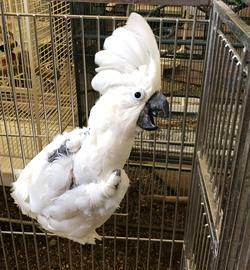 Usually we will not post an adoption fee for a sanctuary bird. Fees do vary. 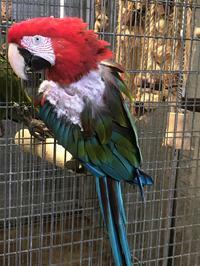 It is important to meet and get to know a pet bird, before you bring it into your home. Surrendered because owners could not pay for veterinary care. Karina is a manageable Amazon and is nice to most people. Yellow Naped Amazon - Jake. Born in 1988 and available for adoption. 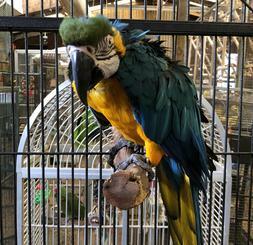 Mature Blue and Gold Macaw. In need of a loving home that loves noise. He will get loud and currently has a feather picking problem. Surrendered earlier this year and is still looking for his forever home. Has a feather picking problem and is looking for a loving home to take him in. Copyright � 2009 Adventures In Birds, Inc. All rights reserved.